Can Quincy Enunwa develop into an outside weapon? Recent reports are that New York Jets WR Quincy Enunwa may be the team’s top option at receiver going into this season. We touched on this topic last week, but today we dive back in to see how Enunwa’s production from the slot compared to his production out wide in 2016. Enunwa saw 428 snaps from the slot last season compared to 111 outside and 28 inline. His outside snaps were almost perfectly split between the left side of the field (57 routes run) and the right (54 routes) but he was a greater threat when he was lined up on the right: he was targeted on 30 percent of his routes when running from the RWR position compared to just 14 percent of the time when running from the LWR spot. Enunwa ranked 32nd among 54 qualifying receivers by averaging 1.22 yards per route run from the slot last season; when he jumped to the outside that average shot all the way up to 2.65 yards per route run. Enunwa caught 10 of 14 targets for 89 yards and a touchdown when he was lined up as a RWR; Jets QBs had a 107.7 QB Rating when targeting him from that spot. 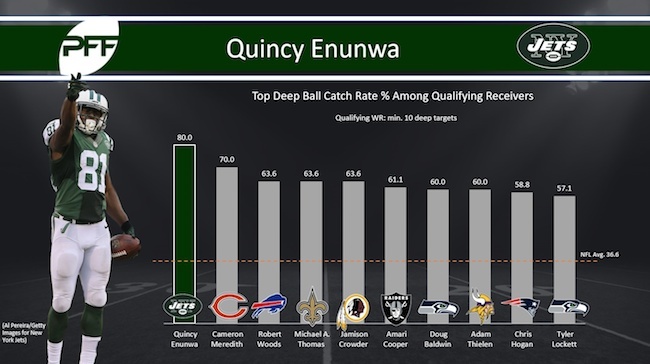 Enunwa also proved to be a reliable deep target, leading all 78 qualified receivers with an 80.0 catch rate on passes traveling at least 20 yards in the air. He was targeted 10 times on deep passes and reeled in eight of them for 278 yards and a touchdown.